Campaign aides believe Michigan, along with Wisconsin and Pennsylvania, are crucial to his chances for re-election. GRAND RAPIDS, Mich. — President Trump returned to this Rust Belt city nearly 2½ years after he made it the final stop of his victorious presidential campaign, this time to declare a political triumph and reset his presidency as he looks ahead to 2020 – and back to 2016. Buoyed by what he called the “beautiful conclusion” to the 22-month special counsel investigation into Russian interference into the 2016 election, Trump arrived to a raucous welcome at a packed Van Andel Arena for a “Make America Great Again” rally he hoped would fortify his base and set a tone for his reelection effort. Trump has felt emboldened since Attorney General William Barr sent Congress a summary of special counsel Robert Mueller III’s report, finalized last week, of his investigation into Russian interference in the 2016 election. Barr’s memo stated that Mueller did not “find” or “establish” a criminal conspiracy between Trump associates and Russian operatives. Though Mueller did not make a determination over whether the president had sought to obstruct justice, Barr said his review of the report determined that Trump had not done so – a conclusion Democrats have called premature since the full report has not been delivered to Congress or made public. The president cast the investigation as an attempt from Democrats, the media and the “deep state” intelligence community to overturn his election. “It was nothing but a sinister effort. . .to sabotage the will of the American people,” Trump said. The president and a bevy of White House aides, as well as some former campaign staffers, were in buoyant spirits as they departed Washington and traveled here aboard Air Force One. As the president touched down on Marine One at Joint Base Andrews in suburban Maryland, some familiar faces were waiting for him on the tarmac: former campaign managers Corey Lewandowski and David Bossie, whose presence lent the trip a nostalgic feel. The two men took photos and videos as Trump, donning his trademark solid red tie, boarded the presidential jet under a clear blue sky. Trump had stopped in Grand Rapids in the early morning of Nov. 8, 2016, Election Day. It was a last-minute decision by his campaign team to stop in this crucial state, where his narrow victory helped power his upset over Democratic nominee Hillary Clinton. During that rally, which took place at 1 a.m., Trump had promised to bring back manufacturing jobs, including those in the auto industry, to Michigan – and told more than 4,000 supporters he would return to the state many times once he did. Thursday’s rally was Trump’s sixth campaign event in Grand Rapids, but his first as president. He returned about a month after being elected as part of a victory tour. Since taking office, however, Trump has struggled to deliver on the promise of jobs, however. The number of auto manufacturing jobs in the nation have risen by 51,000 to just over 1 million, a 5 percent increase since the president took office, according to an Associated Press fact check in February. 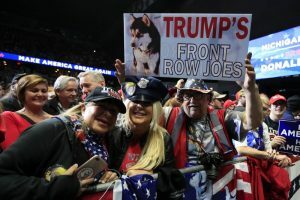 Campaign aides believe Michigan, along with Wisconsin and Pennsylvania, which Trump also won in 2016, remain crucial to his chances in 2020 – and his rally here was a signal that the president intends to campaign heavily through the region. A couple hundred protesters also gathered outside the arena and many more gathered in park a few blocks away, rallying around a giant balloon depicting the president as a diaper-wearing baby.